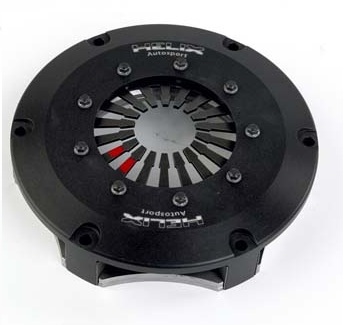 Helix Cerametallic Drive plates have cerametallic segments riveted onto a steel back plate. As a sprung plate, it is more mechanically sympathetic than a rigid plate, taking the shockloads away from the transmission. This will reduce gearbox wear. These are thicker than the sintered type to give a higher heat capacity, while also giving improved heat dissipation where a higher level of clutch slip is required. Cerametallic drive plates are smoother engaging than the sintered equivalent. This design is used mainly for rally applications although it can be used very successfully for racing, especially endurance. There is a wide range of spline sizes available to suit most applications. Please note: These plates cannot be used in a twin plate cover. Low moment of inertia which improves responsiveness. Increased durabitlity,increased drivability compared with 3 paddle options. The dimensions given are the Outside Diameter of the Spline and the Number of Teeth.